Participating in the Mille Miglia is an a barrage of exhaustion, excitement and surreal experiences. As thrilling as it is to race down the middle line surrounded by pre-war racers, modern supercars and the ubiquitous Italian bike police escorts some of the most incredible moments happen once you step out from behind the wheel. Only then do you really get a chance to see what is happening around you. On day two of the 2017 edition my brother and I jumped ahead of the main body of racers so we could get positioned on the Via Vittorio Veneto and watch the cars arrive in Rome. Having heard how terrifying it is to drive in the city I wanted to get there before dusk. For the record, it is no worse to drive in Rome than it is in Boston. The hype is completely unearned. After checking into our hotel we hoofed it through a downpour towards a Harry’s Bar Roma. From here we’d grab a roadside table where we could have a bite, a bottle and watch the cars roll in after 12 plus hours on the road. Harry’s is an old school bar that was the haunt of the rat pack back in the day. Great decor, overpriced (but tasty) food and good wine (goes without saying in this country?). It sits right outside the Porta Pinciana so it offers prime viewing as the cars turn onto Via Vittoria Veneto. Through the on again/off again downpour we watch for hours with thousands of others as the cars slowly made their way into town and across the final checkpoint for the day. Roars of cheering and clapping roll down the street as tires chirp on the pavement and drivers hang from their vehicles and bask in the moment. After a few hours the heavy rain turned into a full blown lightning storm and we headed back towards our hotel to get some sleep before a 13 hour run to Parma. During the walk back I came across a sight that literally stopped me in my tracks. At the Mille Miglia 300 SL’s are commonplace. But while walking past the Hard Rock on Via Veneto, in the midst of all of these amazing cars, I found myself dumbfounded. On the roadside, abandoned and with a plastic bag taped across the passenger window, was a car I saw every time I brought my C63 in for servicing or to have my winters put on. Not the same model mind you... but the literal car. Stateside you’d find this car in an exhibit, behind a velvet rope. This is a car that had been curated by Mercedes-Benz to remind you of the majesty of German racing heritage as you pulled in for a crazy expensive B service. 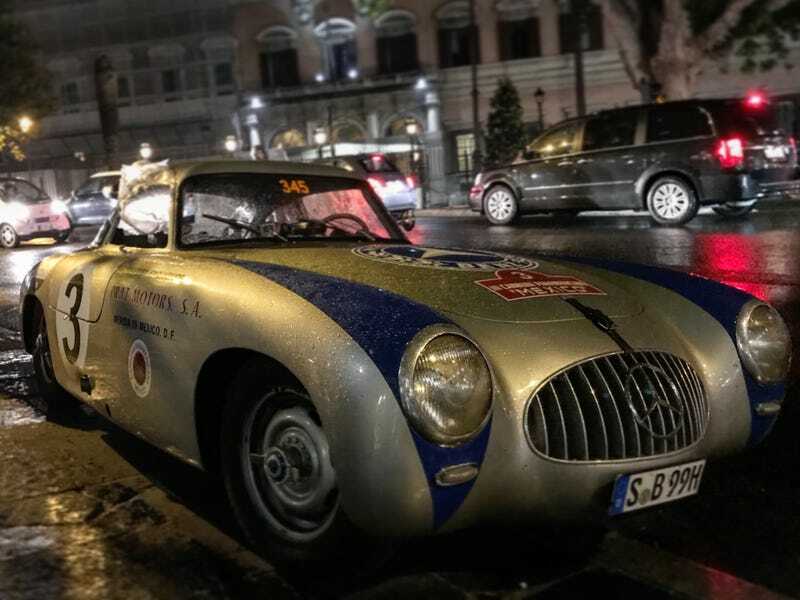 At the Mille Miglia it is just another of the legend sitting in the rain. The Mille Miglia is a chance to move beyond the page or the picture, beyond experiencing motorsports as some abstract event or image on your computer (but keep reading anyway!). Participating in the Mille Miglia, even in an unofficial capacity as we did, is a chance to be a part of the racing history itself and see it unfold before you. To see images brought to drenched and lonely life on the roadside. “Two idiots” is my retrospective looking back at the 2017 Mille Miglia as I prepare to go back for the 2019 event. I’d be interested in hearing about your own experiences (or plans to experience) the Mille Miglia in the comments. You can see more pictures from my experiences in 2017 @runtheredarrow.